Unsurprisingly you may feel that you have taken on rather a lot at the moment. If you are a little stressed and think that life is a bit of a headache – either physically or metaphorically – then you are not alone. Dull grey days do nothing to lift your spirits so you will have to work just that little bit harder to find the joy in daily life! Make some time for yourself, make your world as bright as you can and focus on something that you want to achieve, then just go for it. You will be glad you did. It can help Digestion as it suppresses gastric contractions when food and fluids pass through the GI tract. Relieve colds and flu – ginger tea keeps you warm and promotes sweating. Slice 20 or 40 grams of fresh ginger and steep in a cup of hot water. Add a slice of lemon or small spoonful of honey for flavour and additional vitamin C.
Ginger based supplements can also help with pain relief and inflammation or any kind and is good for cardio vascular health as it reduces the risk of blood clotting and maintains healthy blood sugar levels. Other things associated with November and which are compatible with this month. Important birds to look out for this month are – owls, ravens and falcons. If you spot one of these it is a good omen and will bring you luck. Colours to wear this month are – black, white and purple. Flowers – Chrysanthemum, dahlia and white lily. Myths and Legends for this Month. Nature spirits associated with November are Banshees and any other beings who can carry messages between the world of the living and the world of the dead. A Banshee is a female spirit in Irish mythology, known as a ‘fairy woman’. Each family has their own special banshee, usually thought to be a long deceased family member whose job is it to warn of a death. According to the legend if you hear a banshee scream you can expect someone close to you to die very soon! In Devon (Shebbear) - After nightfall men carrying crowbars with women lighting their way approach a huge stone close to the village church. As the church bells peal out the villagers set to work to turn the stone over. Apparently the devil lives under the stone, and ‘turning the Devil’s boulder’ is meant to avert bad fortune. One legend recalls that the stone was quarried on the other side of the River Torridge at a nearby village, apparently intended as a foundation stone for a church there. But the devil rolled it away to Shebbear – and continued doing this every night as the villagers repeatedly rolled it back during the day. Interestingly the stone is not of a type found locally and may therefore have been transported there in ancient times for some ritualistic purpose. 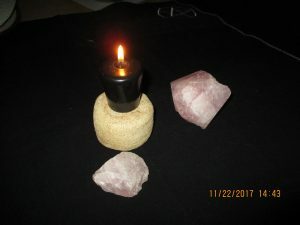 Feel Good Candle Meditation for November. With darkening days and nights here is a useful meditation that you can do for protection, calm and well-being. All you need is a lit white candle or flames from a fire. Sit or stand comfortably and look into the flame, breathe gently in and out to the count of four until you feel nice and relaxed. 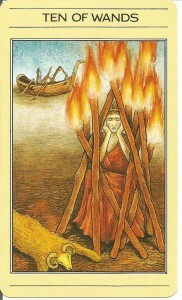 Visualize the flame bathing you with its warm, glowing, protective light. It is surrounding you with warmth and protection and you feel safe and relaxed. Stay like that and enjoy the feeling for a few minutes then when you are ready, count in your head backwards from ten back to one. Give your arms and legs a little shake to bring you back to normality and ground yourself once again.